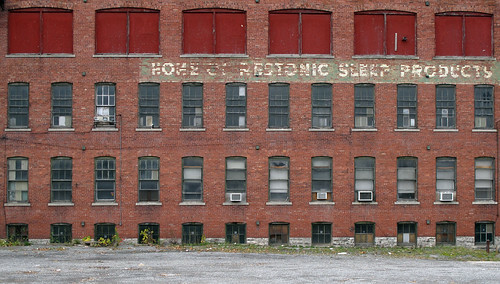 See Shooting Buffalo for more about this series and my flickr for additional pics of Buffalo, NY. 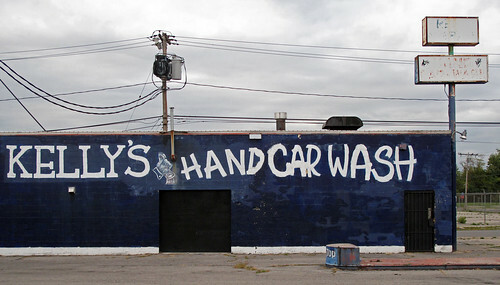 I'm collecting this daily series of pics - here. 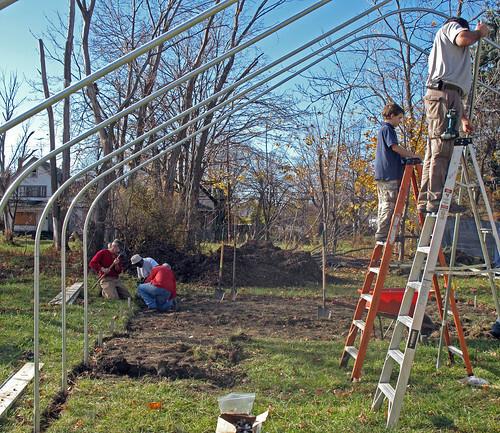 On Saturday afternoon supporters of what's quickly becoming the city's largest urban farm met on Wilson Street and assembled a hoop house. Mark & Janice Stevens have entered into a cooperative agreement with the Community Action Organization to build and eventually own this structure. 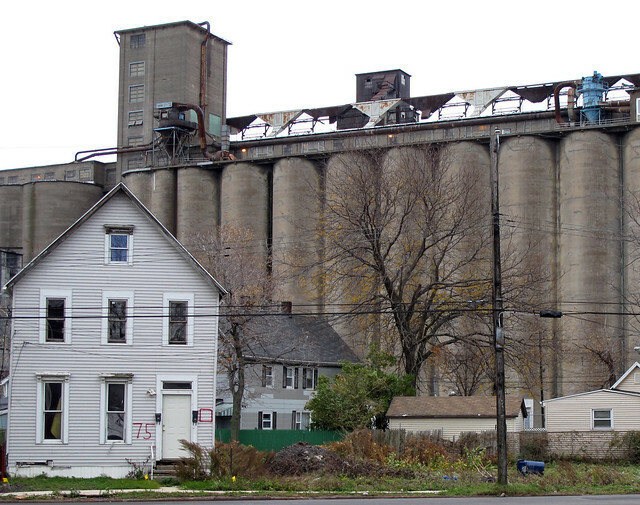 Earlier this year the CAO received federal stimulus dollars to help promote healthier eating and dietary practices in some of Buffalo's poorest and at-risk neighborhoods. 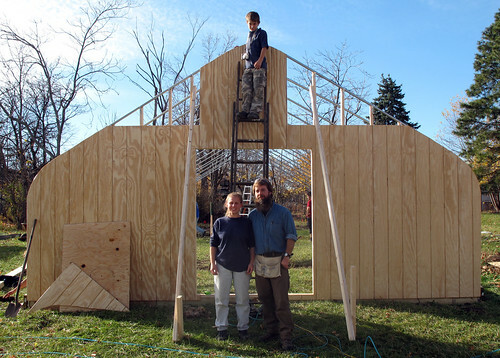 The farm's new hoop house is a direct result of this program. University at Buffalo professors, neighbors and family members were on hand to help. 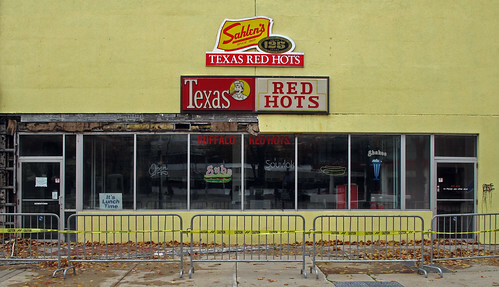 In a case that was widely celebrated in the local activist and blogging community, fixBuffalo readers may remember the Stevens entered into a model renewable land-use agreement with the City of Buffalo last Spring. According to Mark the hoop house will extend the farms growing season and will first be put to use late in the winter for a head start on next year's harvest. Make sure to check out the Wilson Street Urban Farm blog and Face Book group. Site work and construction at Kaleida's new Global Vascular Institute is well underway. 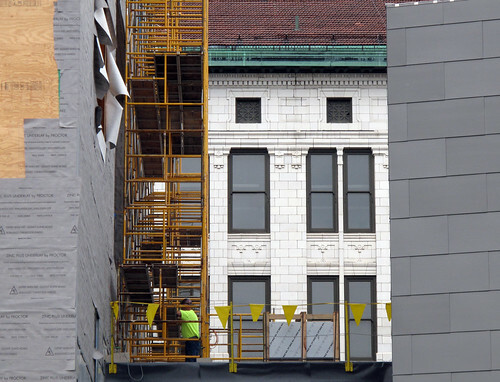 This pic is one of a growing series of weekly interval shots taken from the City's parking ramp on Ellicott Street. That's City Honors HS over on the left. This $500m project comes on the heels of $100m of public investment in arts and education in the neighborhood that includes Artspace, City Honors, Performing Arts and the county's new Merriweather Library on Jefferson. See the Kaleida Archive for additional information, pics and posts. 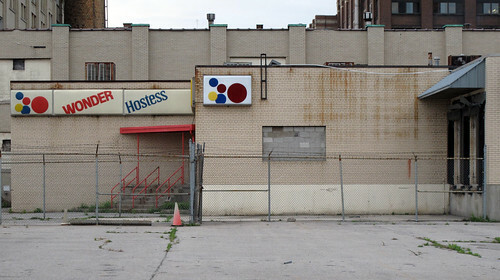 One of the City's most recognizable street scapes, at the end of Louisiana Street, is almost gone. 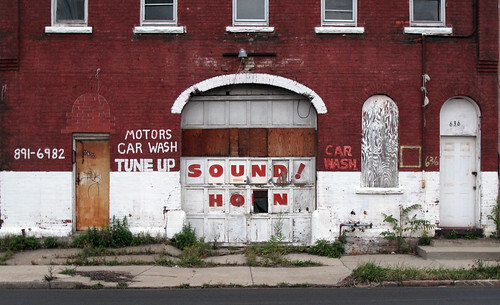 This neighborhood, once home to grain scoopers, longshoremen and foundry workers and filled with some of the finest examples of Great Lakes Workers Vernacular, is disappearing. 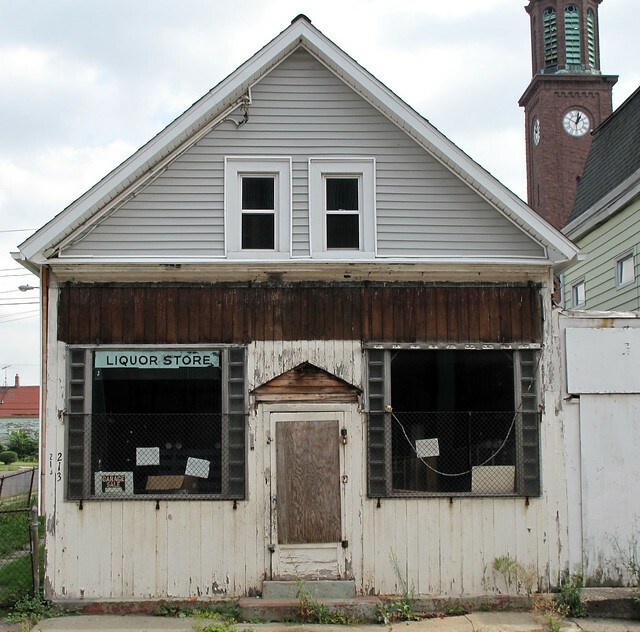 Both 71 and 73 Louisiana were picked up by the city during recent tax foreclosure proceedings in 2005 and 2007 and later demolished. 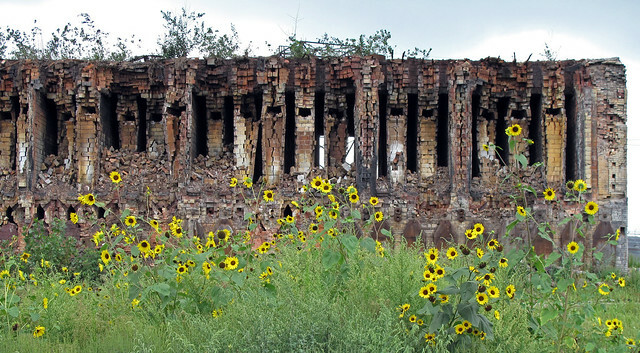 The first pic, from September 2006 - Buffalo River Trip - clearly shows both 71 and 73 in an advanced state of decay. At the time 75 Louisiana appeared occupied. The bottom pic is from a recent First Ward neighborhood walk earlier this month. 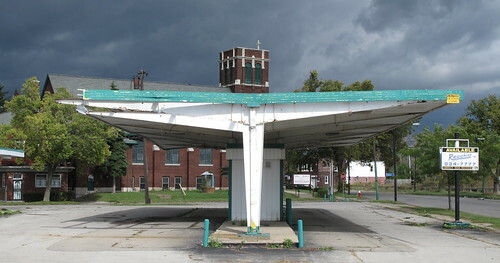 75 Louisiana is now abandoned and on the City's demolition list. 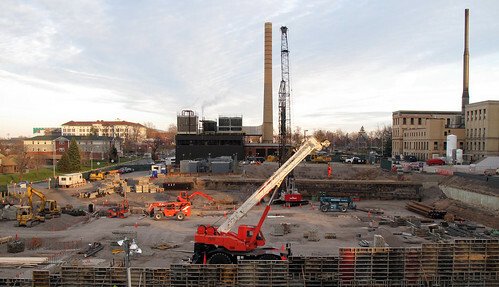 Update - 11/19/09 - Here's another view, from 1995. 71, 73 and 75 Louisiana are on the right hand side of this pic. 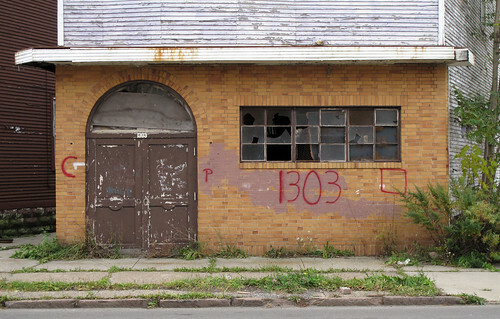 Update - 11/20/09 - According to City records 71 Louisiana was demolished pursuant to court order in 2006 for $21k and 73 Louisiana was demolished in 2008 at a cost of 9k. 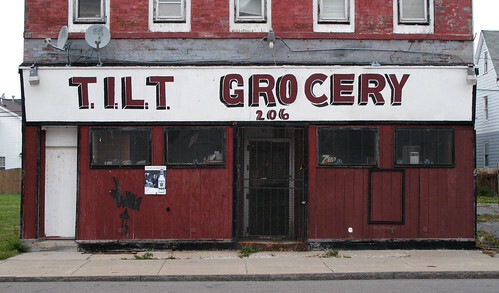 The City hasn't recovered the cost of demolition from the former owners. 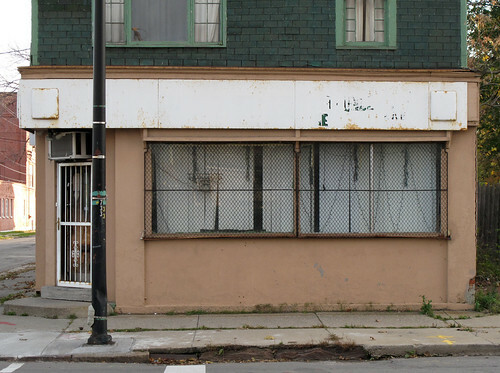 In August an emergency demolition order was issued by the commissioner for the demolition of 75 Louisiana Street. Kaleida's expansion into the neighborhood includes the planned demolition of seven structures - six houses and a former gas station - first mentioned here last December in the High/North street block. 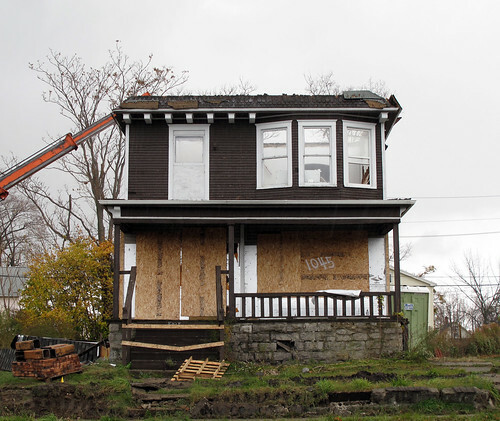 Buffalo ReUse has been awarded the demolition contracts and the deconstruction of one of the six houses at 1045 Michigan Avenue began last week. 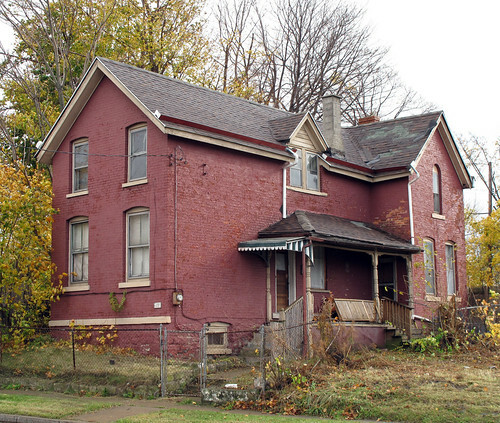 This fate of this little brick house - threatened with demolition - on the corner of North, near Michigan remains uncertain as it was recently determined by SHPO to be eligible for the National Register of Historic Places. Check back soon for additional pics. See the Kaleida Archive for additional information. Vast neighborhoods on the City's East Side continue to disappear as residential structures are vacated, demolished and dumped in landfills. 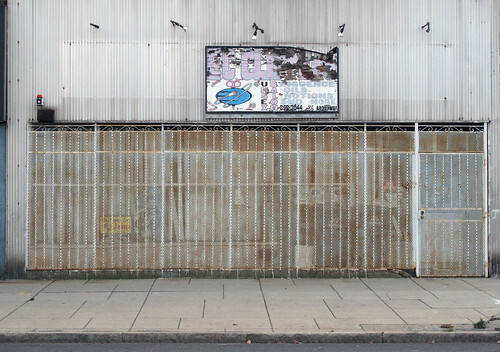 The commercial fabric along some of the City's great streets is carted away too. 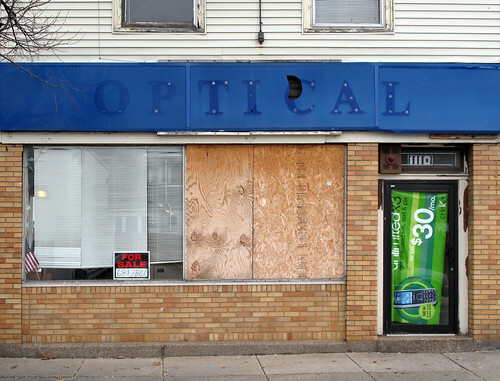 fixBuffalo readers may remember a series of posts involving a City owned building at 669 Genesee Street. 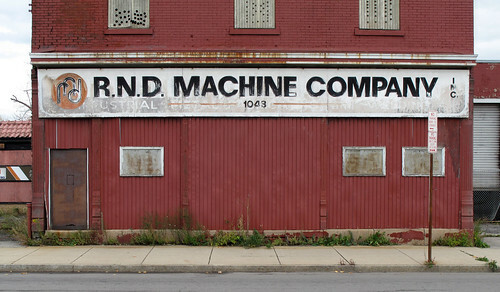 The view from 669's roof has been this blog's banner photo from the beginning Another iconic commercial structure at 311 Genesee was demolished in August. Walking and shooting Genesee Street over a period of time has revealed additional changes. 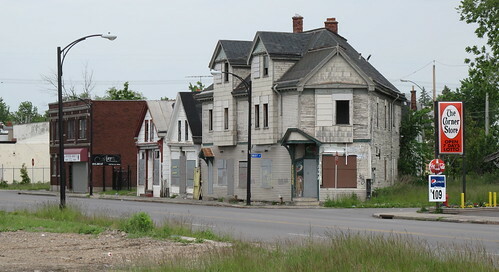 This collection of mixed use buildings near the intersection of Leslie and May Streets has been home to various retail establishments over the years including a very cool bbq joint that was situated in the unique corner spot here at May and Genesee. The same perspective from Leslie Street a few months later reveals how quickly the mixed use fabric of residential and commercial buildings is disappearing. While a google flyover of the City's East Side shows the ever increasingly larger urban prairie from the comfort of a laptop, walking the neighborhoods reveals the true level of the disaster City residents face on a daily basis. 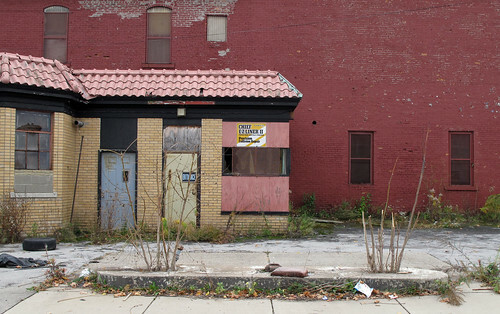 The hollowing out of neighborhoods and the disappearance of the City's commercial fabric is palpable. 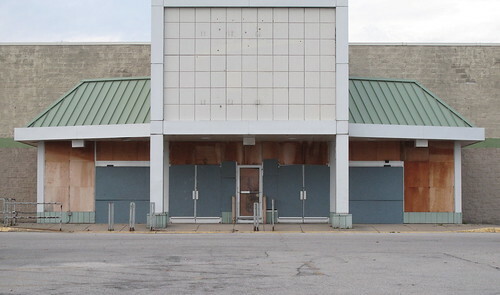 Structures that are here today are literally gone tomorrow. 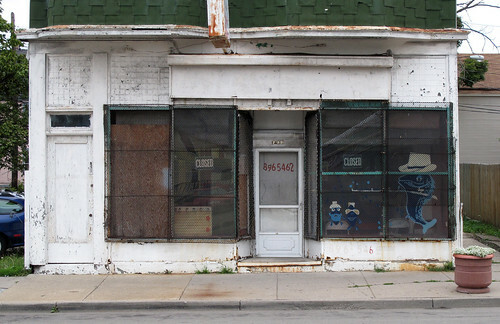 The pace of disappearance and the transformation of the City's streetscapes seems to be accelerating. Perhaps next year's new Census data will reveal the true nature of the changes. 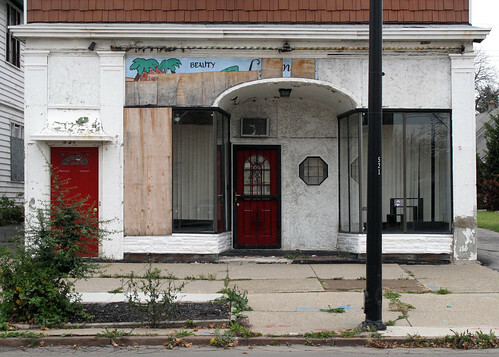 Economic development still seems lop sided and tilted towards non-strategic housing development and what keeps people in Buffalo and in their homes - job creation - is an after thought. 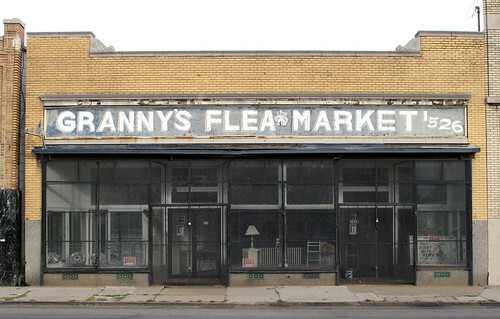 Additional pics are being collected on a regular basis in this Genesee Street flickr series. A visit to City Honors this week revealed substantial progress in the $40m renovation of an East Side landmark. 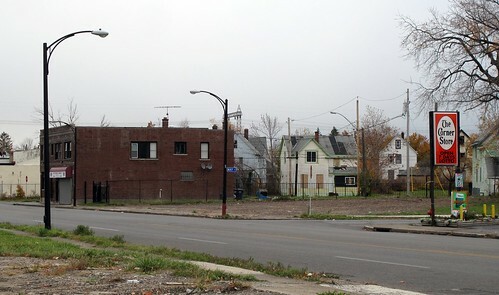 Site plans include the demolition of Wooodson Gardens - a 16 multi family building site - on an adjacent parcel that have been owned and managed by the Buffalo Municipal Housing Agency since 1983. 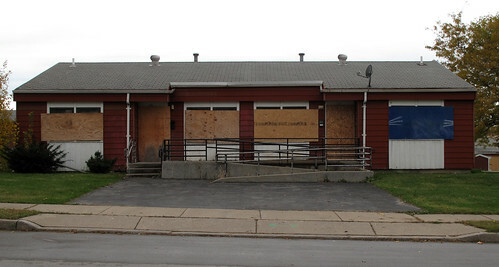 These residences were recently vacated and are now boarded and waiting for demolition. The site will eventually become City Honors' new playing field. 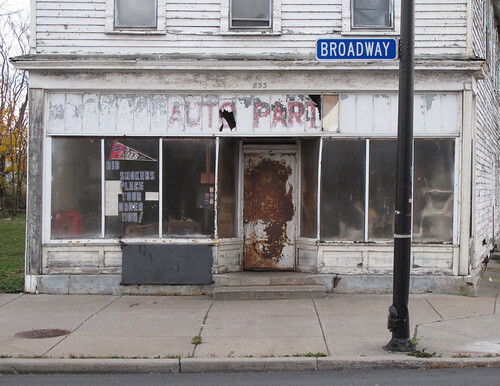 Here's the rendering from Buffalo's leading architectural firm Hamilton, Houston and Lownie. The magnificent view of City Honors along Best Street and the great front lawn has been significantly reduced. A sliver of what's left remains visible between the new natatorium and all-high gymnasium. 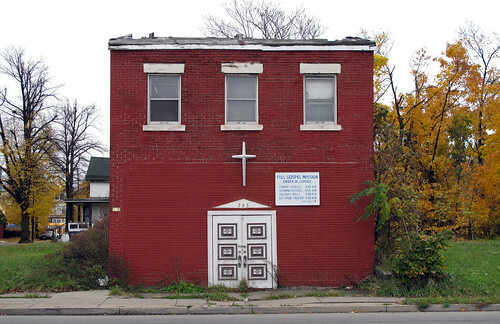 This is one of the 16 BMHA buildings that will be demolished. 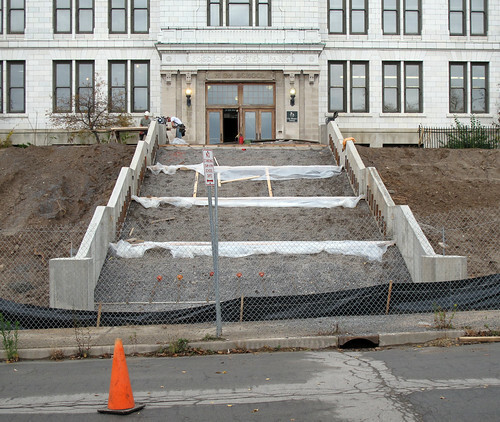 A new main staircase is under construction here on Fosdick Street. 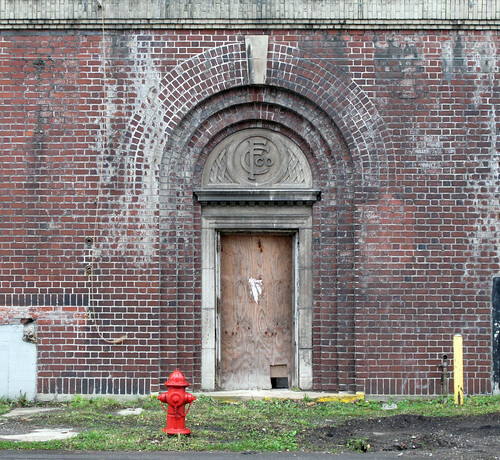 According to the rendering from Hamilton, Houston and Lownie this will become the new public entrance, with its front returning to the school's historic roots and visible from Michigan Avenue. Check out the City Honors archive for additional information and new pics. The long awaited reconstruction of the playing fields, facilities and running track at Johnny B. Wiley is still on schedule and is expected to be completed next Spring. 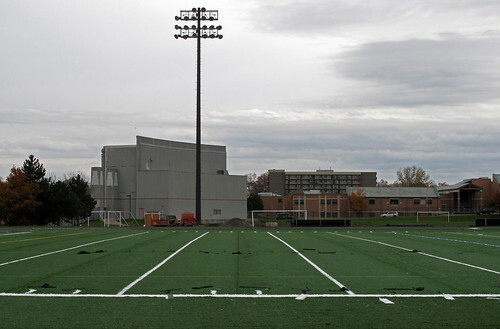 The two million dollar project includes a number of upgrades to the facilities at the site of the former War Memorial Stadium. 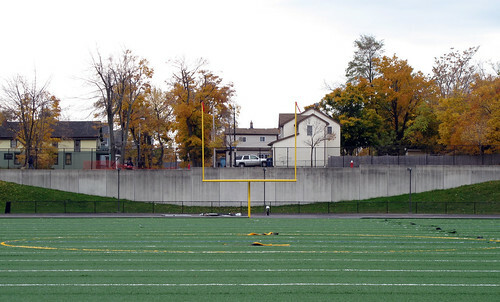 Re-pitched with new draining systems, the football field was covered with artificial turf this past week. New goal posts were installed. 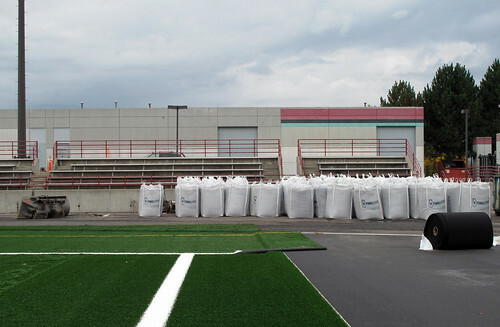 The track's new synthetic surface arrived in one ton bales and is expected to be installed this week. This project - which had been stalled for the better part of a decade - is another puzzle piece that's fitting into place and is patterned after a growing list of public investment in the area between Main/Jefferson and Ferry/Best. Artspace, the Merriweather Library, Performing Arts and City Honors are each contributing to the neighborhood's renewed vitality. The Kaleida/UB project - here and weighing in at $500m - is right next door. See Part I - additional updates to follow.